Heath Lang of Qdos Landscapes is a bit of a stickler for quality. His high standards run right through from purchasing plants and materials to the installation and finishing of his work. 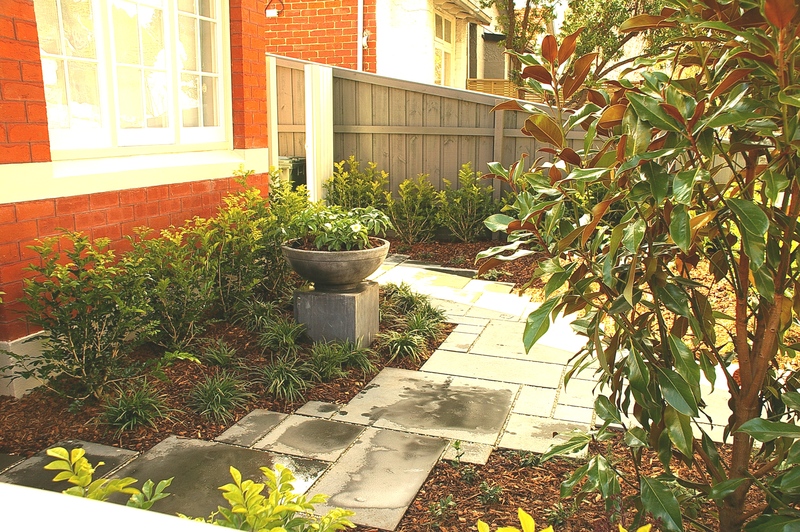 For the front garden of this Edwardian home in Elwood, the owners wanted a simple but elegant design with a definite focal point. Attention to detail was crucial. Heath used the front path as a design feature, forming a Vee shape and drawing the eye to the urn and pedestal. The Murraya hedge will add structure to the garden as it matures, and the specimen planting of Magnolia ‘Kay Parris’ and Cercis ‘Forest Pansy’ will give height, colour and seasonal interest, as well as defining the boundaries. Liriope line the edge of the paving, and as they grow and spread they will soften the boundary between the hard and soft elements of the design and connect the various elements.Its nice to see one of my favourite plants, Helleborus orientalis (Winter Rose) used in the urn. Heath choose Ashlar patterned Bluestone pavers with beveled edges. These are edged with 7mm Seymour pebble. This gives a clean, sophisticated look with the pebble edging offering a defining contrast. The paving is continued down the side of the house where the border has been planed with Betula pedula ‘Fastigiata’, the upright Silver Birch, under-planted with Arthropodium cirhhatum (NZ Rock Lily) . The sheltered position is ideal for growing both the plants, and the beautiful white trunks of the birch will contrast nicely with the mid-green Arthropodium and the dark grey of the paving. As ever, simplicity of design and quality installation are the key to success.